FareHarbor is an online-based booking and schedule management solution intended for tour and activity companies and organizations. The software helps transform websites into powerful booking and scheduling platforms with its extensive host of features and functionalities, including embedded calendars, activity displays, and the recently optimized Lightframe checkout tool. FareHarbor integrates with travel and booking services such as TripAdvisor and PicThrive to further boost your company’s exposure and help you reach out to large and diverse audiences. The platform is easy to use and seamlessly integrates into your business website. It also offers offline booking capabilities so you can still book your clients even when it’s outside store hours. FareHarbor boast over 2,700 clients and has helped in contribting to more than $1 billion to the tourism industry. FareHarbor delivers a suite of powerful scheduling and booking tools and features designed to boost the capabilities of tour and activity operators. Branded as the best booking and management software for companies in the touring and activity industry, FareHarbor makes it easy for users to get acquainted with the system and learn how to fully maximize the software to its fullest potential. First time users of FareHarbor will receive one-on-one training with an Onboarding expert to ensure that they are ready to get things started on the right foot. The software also comes with 24/7 support from the company’s Denver-based customer service and marketing teams. The crew will provide topnotch technical, hands-on support to users anytime, anywhere, at no added cost. With FareHarbor, users get a simple and very professional booking interface that seamlessly blend with any website. Thanks to its customization features, users can easily tailor the system to fit their brand as well as their services, whether you offer bike rentals or take tourists for a whale watching adventure. As most online reservations are made when you are offline, FareHarbor ensures that you don’t miss any booking opportunity. Even if it’s outside business hours, you are still on top of your business with the 24/7 live dashboard. With easy-to-use calendar widgets and simple one-screen checkout process, FareHarbor ensures that your customers have the best experience possible. You can also monitor essential metrics and performance indicators like conversions and cart abandonment rates, providing you with insights on areas that require immediate action and improvement so you can further deliver quality services and overall customer experience. 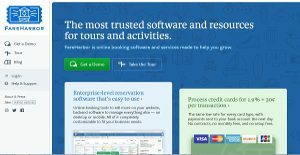 If you are interested in FareHarbor it could also be a good idea to check out other subcategories of Best Appointment Scheduling Software gathered in our database of B2B software reviews. Since each enterprise has specific business wants, it is advisable for them to abstain from looking for a one-size-fits-all faultless software system. Needless to say, it would be pointless to try to find such a platform even among market-leading software solutions. The intelligent thing to do would be to list the various vital elements that require consideration such as main features, budget, skill levels of workers, company size etc. Then, you should do your research thoroughly. Read some FareHarbor reviews and check out each of the other systems in your shortlist in detail. Such exhaustive groundwork can make certain you weed out ill-fitting platforms and choose the solution that provides all the aspects you need for business success. How Much Does FareHarbor Cost? We realize that when you make a decision to buy Appointment Scheduling Software it’s important not only to see how experts evaluate it in their reviews, but also to find out if the real people and companies that buy it are actually satisfied with the product. That’s why we’ve created our behavior-based Customer Satisfaction Algorithm™ that gathers customer reviews, comments and FareHarbor reviews across a wide range of social media sites. The data is then presented in an easy to digest form showing how many people had positive and negative experience with FareHarbor. With that information at hand you should be equipped to make an informed buying decision that you won’t regret. Worst company to sign up!!! What are FareHarbor pricing details? What integrations are available for FareHarbor? None. They don’t answer their calls. Wasted over a week, never got a follow up call. If you need more information about FareHarbor or you simply have a question let us know what you need and we’ll forward your request directly to the vendor.